I think almost every family has their “special breakfasts” and for a large number of people that breakfast includes pancakes. My family is no exception. When I was growing up, from time to time, usually on a Sunday, my parents would make us a big family breakfast. Pancakes, bacon or sausage, scrambled eggs. My Dad loves good real maple syrup, so that flowed abundantly. My oldest son loves pancakes. On Saturday or Sunday I often made the boxed version for him. Cooking them is a bonding time for us, he loves sitting on the counter and stirring the batter for me. We talk about super heros and race cars. One Sunday he requested pancakes but I was out of the boxed stuff. I figured, this can’t be that hard to make from scratch, so that very morning I googled pancake recipes and started testing. Many of the recipes were perfectly acceptable. Eventually I stumbled upon THE recipe when reading Best Food Writing 2003. In “With Pancakes, Every Day Is Sunday” Lucian Truscott IV shares his recipe for Mississippi Pancakes. The original recipe is fantastic as is. 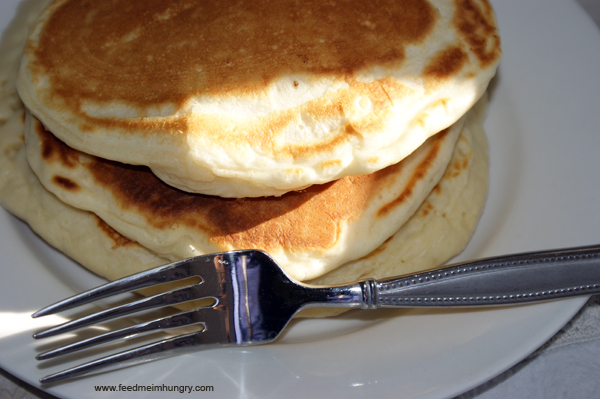 Though I found the cakes thing looking at first and had to get used to the look, they are the most flavorful, light, and airy pancakes ever. I’ve adapted the recipe (barely) to a buttermilk version. 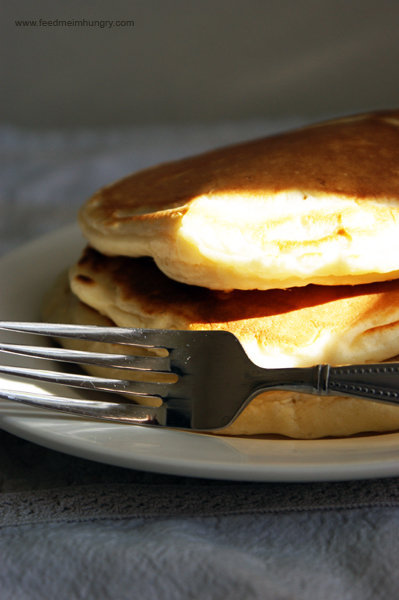 Give it a try for your next Sunday pancakes. In a large mixing bowl whisk eggs until foamy. Add the wet ingredients and mix in gently using the whisk. Add the dry ingredients and mix until all ingredients are incorporated. I recommend using the whisk. Cook pancakes in the normal way, watching for lots of bubbles in the batter before flipping.